This is an authentic photo from official Soviet Russia archives. Can it be so that Soviet Russian goverment concealed their plans of replacing Russian people with human like robots or androids? 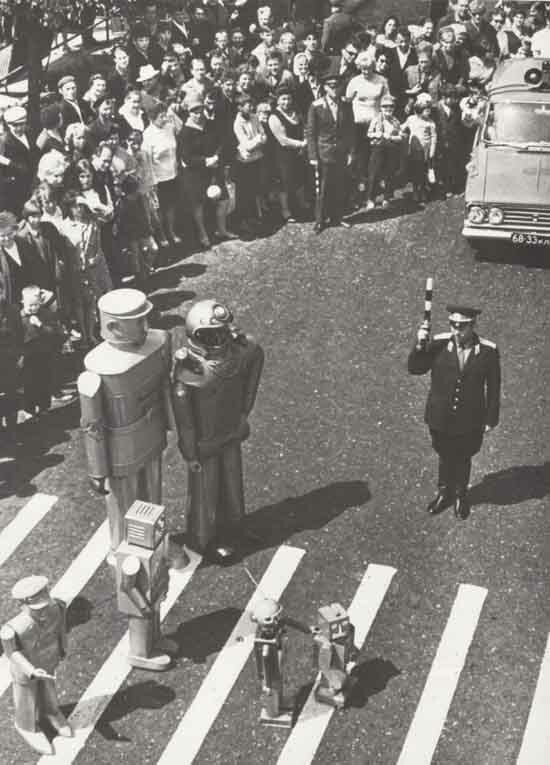 It could be a great step forward towards Soviet ideals – an average robot is much more convinient for a Soviet goverment than an average Soviet citizen. According to the photo first species of those robots were treated with all honours, I wonder why they closed the project? Was it a lack of budget? HILARIOUS. Seriously, I laughed out loud after reading LR’s comments. I don’t think I have ever met anyone, in person or on the internet (and that’s saying a lot) who is more “full of themself” than LR. Oh, and you mis-spelled “elixir”, LR. I AM ROBOT. FEED ME E-LE-CTRI-CI-TY. This website is definitely again Russia and everything Russian/ Soviet. According to this website, everything Russian/Soviet is inferior, not good, infact everything Russian or Soviet is a bad copy of the West (esp. American). Well … i say this website is for the Ignorant. And yes i have seen Ignorant Americans as well. Not all Americans are ignorant though.